Those are very fun videos, Mack!! We like them a lot! OH, that was fun, Mack - we love watching you chase the RLBs. Did you ever catch it? I'll give you a kiss, Mack! It's great to see you in action, Mack! Sheesh, lady, no means no. The stuff you put up with. Those red light bugs are tricky little suckers! You did a great job trying to catch them! OH MACK... those were super videos. I really liked the RLB thingy. Oh BOL - very cute videos! PeeS Tell your sweet momma dat if her opened a boxer doggie daycare I would come to it. I would just have to convince my mom dat we has to move to Texas. I just want to say that in the video in your last post, Paris is making every single cocker spaniel face that I make when I get a belly rub. And although I know she's been dating other men lately (AHEM), I still think she's one hot piece of hiney. Be nice to her Mack. Cockers are crazy. Most pawsome. Good luck catching those RLBs. God bless our good Texas buddies. Your videos are funny! And your house is not as messy as ours! I wanted to thank you for coming to my birthday pawty! My Hairy Slobbery Sisters had a lot of fun with all the doy guests and want to thank you for dancing with them! Mack, you are such a coy devil! Nice to see you in action! Glad I doesn't has any red bugs in my house, they look super annoying!! 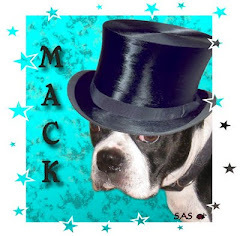 Mack - can you please email your snail mail address to me at tuckergreatdane@gmaildotcom? I need to get your book out in the mail. take a good care of the please! !